Ahead of BBC Sports Personality of the Year on Sunday, we recall six occasions when English football figures featured prominently in the event – from the four who won the overall award, to the occasion when a potential winner failed to even make the top three and the night an emotional presentation was made to Sir Bobby Robson…. Although the BBC Sportview Personality award was created in 1954, football did not produce a winner of the coveted prize until 1966. If ever there was a year that was nailed on for football to triumph this was it, given England’s glory in the summer. It was captain Bobby Moore who took the award thanks to votes from the viewers, but hat-trick hero Geoff Hurst had to contend with third place as New Zealand-born speedway rider Barry Briggs finished above him in what looks a quirky result nearly 50 years on. But Hurst would say years later it never crossed his mind that he might win the award. 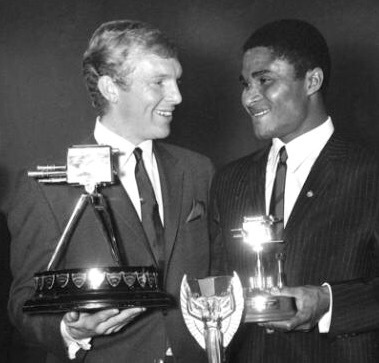 Bobby Moore and Eusebio compare trophies. Hurst and Moore were also part of the England team which won the team of the year accolade, while the World Cup’s influence was reflected in Portugese star Eusebio jointly winning the overseas personality award with cricket star Garfield Sobers. In an era of just three awards, it was as close as football was realistically going to come to a monopoly. 1986 had been Gary Lineker’s year. He had finished as World Cup golden boot winner, First Division top scorer in 1985-86 with Everton as well as PFA and Football Writers’ Player of the Year and he earned a big-money move to Barcelona. In a year of limited sporting glory for Britain, the stage seemed set for him to be the first footballing winner of Sports Personality of the Year (SPOTY) since Moore 20 years earlier. At the awards ceremony, Lineker saw Liverpool’s double winning player-manager Kenny Dalglish take third place and athlete Fatima Whitbread scoop second spot. Was Lineker about to be announced as the winner? No. Instead, Formula One world championship runner-up Nigel Mansell took the gong after a year when the title was snatched away from him at the death thanks to his rear tyre exploding in Adelaide. “It has come a complete surprise,” said Mansell after Henry Cooper announced him as winner. Lineker may have thought likewise. Gary Lineker had plenty of trophies to his name in 1986 – but Sports Personality of the Year wasn’t one of them. “I hadn’t actually written my acceptance speech but I did think I had a decent chance,” Lineker told The Telegraph in an interview in 2007. He reflected on whether he paid for now earning his living abroad, in an era when British viewers saw far less of Barcelona in action than they do now. “I’d sort of disappeared, hadn’t I?” he said when reflecting on missing out, while also believing football’s reduced popularity at the time did not help his cause. He would eventually clinch third place in 1991 and Lineker has gone on to enjoy a long presenting stint on the show – some consolation we guess for not winning the main honour. There are a lot of misconceptions about the award being about someone’s ‘personality’, meaning cyber warriors will bemoan winners for apparently lacking one and believing being able to stand up and crack gags should be a prerequisite for winning it. But 1990 was an instance when someone’s charisma helped play a part in them taking the award, coupled with their on-field contributions during the year. There was no question Paul Gascoigne had enjoyed a successful tournament at Italia ’90, but as we saw with Lineker four years earlier having a good World Cup was no guarantee of a player being in serious contention for the SPOTY award. But Gazza’s tears in Turin, England coming so close to winning the competition and the subsequent rise of ‘Gazzamania’ had made him a star name and he was duly presented with the award by Bobby Charlton. 1990 had been Gascoigne’s year, although even then there were concerns raised about how well he’d be able to handle his new-found fame. “They say it’ll ruin your football,” said presenter Des Lynam as he interviewed Gascoigne – wearing a bow tie – on the night. 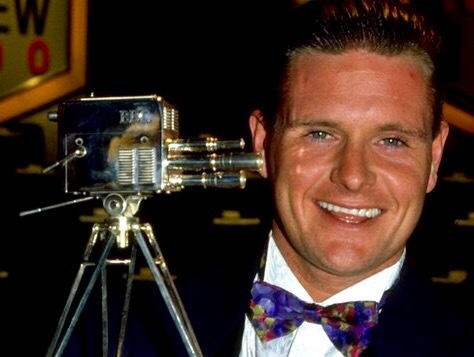 Paul Gascoigne triumphs in 1990. 1990 represented a year of change for Sports Review of the Year and not totally for the better. It began with Lynam and co-host Steve Rider having to pretend to be running late for the show, something Lynam hinted in his autobiography he was unimpressed with. There was also an attempt to review the year month-by-month rather than the familiar format of by each sport – this would thankfully last just for one year. Football didn’t have things all its own way, with England’s efforts at Italia ’90 failing to win them the team award – Scotland’s rugby union team took it after a Five Nations grand slam – and the overseas personality accolade went to Australian rugby league player Mal Meninga rather than any World Cup star such as Roger Milla. But as the decade progressed, football’s resurgence would continue. In 1996, Alan Shearer finished as Euro ’96 top scorer but he failed to finish in the top three of SPOTY, which perhaps provided comfort to his future Match of the Day buddy Lineker. But then two years later football claimed its third winner and one of the youngest in the history of the award, as Michael Owen collected the accolade on the eve of his 19th birthday. His wondergoal against Argentina in the World Cup proved decisive in winning the public vote, even though the match ended in heartbreak for England. Owen gave a short speech after Lynam announced him as the winner, in which his nerves were clearly – but understandably – on show. “It’s been a great early birthday present,” he said, as he proudly held the trophy. Owen’s award was to be the last act in Lynam’s years as a host – the party games element that he became associated with went with him (a table football contest was staged one year, Frank Bruno inevitably being one of the participants). And soon the longstanding Sports Review of the Year title for the show was no more, with now both the programme and main award known as Sports Personality of the Year as the emphasis increasingly became on the awards. Where Owen was hailed a hero after the 1998 World Cup, Beckham was hounded for his sending-off against Argentina. But he put the episode behind him to finish second in SPOTY in 1999 after helping Manchester United win the treble. Two years later his stoppage time free-kick against Greece took England to the World Cup finals and won him the award. The pain of three years earlier was now banished to the past. Considering it wasn’t a World Cup finals year, football featured incredibly prominently in the awards – reflecting the level of popularity the sport was now enjoying. Owen was third in the main award, while Liverpool won team of the year. Sir Alex Ferguson received the lifetime achievement award and Sven-Göran Eriksson capped his first year in charge of England by winning the coach of the year accolade. Since then though, the only footballing winner of the main SPOTY award was Manchester United’s Welsh star Ryan Giggs in 2009. For Beckham, his SPOTY successes weren’t over yet. 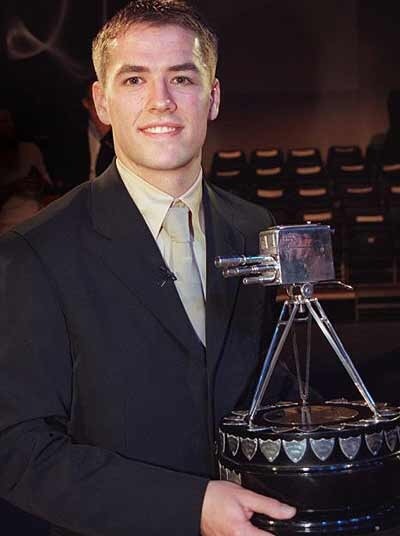 He took second place in 2002 and then in 2010 he received the lifetime achieving award, aged just 35. He was far younger than other recipients of the award, including Sir Bobby Robson who had collected his honour in the most memorable of presentations three years earlier. Due to the format it now adopts, SPOTY is not without its critics today. But one of the enjoyable elements of the show in recent times has been the presentation of a lifetime achievement award. One of the most memorable occasions came in 2007, when former England manager Sir Bobby Robson made his way to the stage to receive the accolade. As he stood there, the entire audience stood and clapped and clapped for one of the longest standing ovations you are likely to see. Robson must have cast his mind back to occasions such as when England were held to a draw by Saudi Arabia in 1988 and he was portrayed as public enemy number one in the press. Now he was seeing just how loved he was by so many people – and not just within the world of football. It was a lump in the throat moment for Robson and so many others. Presenter Lineker later admitted it was only the prolonged applause that enabled him to regain composure as the emotion of the moment got to him. Sir Alex Ferguson even put aside his long-running feud with the BBC to present the award. Robson spoke of his pride and told of how his father would have somersaulted his way from Durham to see him collect the honour in Birmingham had he still been alive. The following year, another English footballing Sir Bobby – Charlton – would follow him in winning the accolade and he also received a prolonged standing ovation.